The Haverland RC13BL provides an independent heating system for your conservatory, with a reduced height and integrated controls. The ideal choice for fitting on dwarf walls, the RC13BL offers energy-efficient heating with the option of creating a weekly schedule that caters to your every whim. Download Product Overview and Data Sheet here. The RC13BL comes with a standard UK 3-pin plug and can be easily wall mounted DIY using the brackets provided. For a more discreet fitting with no visible wires, it can also be hardwired to the mains by a professional electrician. 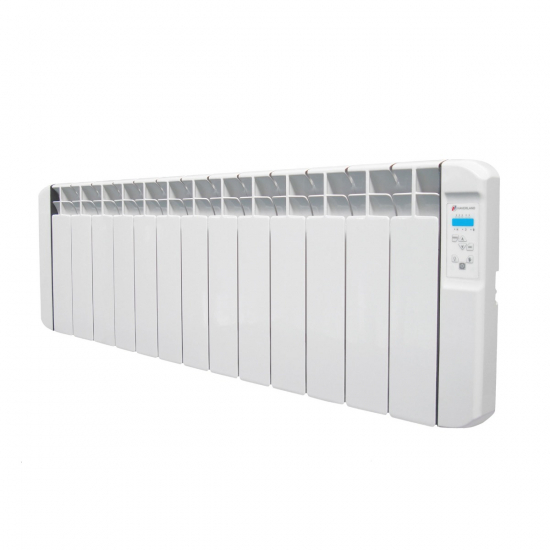 The RC13BL conservatory radiator comes with a 10 Year Manufacturer’s Guarantee on the radiator body and a separate 3 Year Guarantee for the electronic components. The ease of installation and separate control systems offered by electric radiators makes them a fantastic solution for heating conservatories. The Haverland RC13BL electric radiator is expressly designed for this purpose, giving users greater control over their conservatory heating by using digital control options and energy-efficient liquid heating elements. Within the RC13BL is an engineered thermal fluid which creates an even spread of heat across its surface, as well as uniform heat distribution throughout the room. The thermal liquid also has exceptional heat retention qualities to maximise efficiency and means the RC13BL doesn’t need to work as hard to maintain comfort temperatures. Running costs and energy usage is kept as low as possible due to its precision digital thermostat which will ensure the radiator switches off as soon as it reaches the correct temperature. The additional management features included with the RC13BL allow you to choose from 7 pre-programmed heating schedules, or even create your own personal heating schedule tailored to your lifestyle. The programming facility is so in-depth, it can be used to set a different heating mode for each hour of the day, seven days a week – a completely flexible system with plenty of scope for personalisation. Setting a heating schedule can reduce energy waste by ensuring the room is only heated at times dictated by the user, but for those who use their conservatory infrequently, it also has a manual mode for on-demand heating. Built into the radiator body is an easy-to-use digital display that includes a locking function to prevent the keypad from being tampered with. Using the controls, you can set temperatures for the radiator’s comfort, economy and anti-freeze modes, as well as access its energy monitoring feature. This function will show you the current energy usage of the radiator in kilowatts so you can monitor exactly how much electricity the heater is using at any given time. The low profile of the Haverland RC13BL allows it to fit conservatory dwarf walls with ease, as well as other areas of the home with reduced wall space, such as loft conversions. It sports a slimline housing and modern design that will blend well with any interior décor. The RC13BL can be installed easily with the minimum of fuss, even if you have no previous DIY experience, although it can also be hardwired to the mains by an electrician for a wire-free finish.